Mobility aids are typically used by older adults who are at risk of falling. There are several types of mobility devices that can help seniors maintain their balance. Take a look at some of the best mobility devices for your aging parent. Canes can support body weight and help seniors transmit the load from their legs all the way to the upper body. Some seniors are afraid of using canes because they compare the devices to crutches. While crutches and canes have some similarities, the devices have a few differences as well. For example, canes take a significant amount of weight off of the lower body and place more pressure on the arms and wrists. If this is an issue, older adults can use forearm canes for extra support. Canes help seniors with balance issues by making it easier for them to walk around without the fear of falling. Seniors who need help moving around the home should consider professional in-home care. In Richardson, senior care providers can benefit aging adults in a variety of ways. From cooking nutritious meals to offering timely medication reminders, the dedicated caregivers at Home Care Assistance are available to help your elderly loved one 24 hours a day, 7 days a week. If your parent has been advised not to put weight on his or her lower limbs, consider buying a wheelchair. Wheelchairs can be pushed by family caregivers, manually propelled by seniors, or electronically powered. Older adults who live with severe joint pain or muscle injuries should consider using a wheelchair. Many seniors use walkers, which are typically made up of a metal framework with four legs. Older adults can place the walker in front of them and move it each time they want to take a step forward. 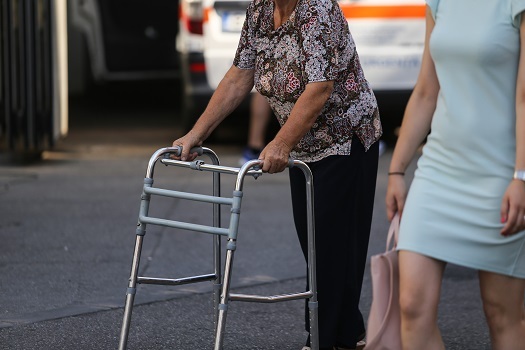 Some walkers have glides or wheels on the base of the legs that allow seniors to slide the devices instead of lifting them. There are a variety of age-related health conditions that can make it more challenging for seniors to live independently. However, many of the challenges they face can be easier to manage if their families opt for professional elder care. Richardson families can rely on expertly trained caregivers to keep their loved ones safe and comfortable while aging in place. Seniors can easily use the handlebars and steering wheel on scooters to control the direction they’re moving in. Scooters are generally battery-powered mobility devices that offer an alternative to wheelchairs. Before using a scooter, your loved one should receive some training on how to use the device. If your parent is unable to walk up and down the stairs at home, consider purchasing a stair lift. Stair lifts are also known as chair lifts because seniors can sit comfortably in a chair while the device moves up the steps via the stair railing. A stair lift could give your loved one peace of mind while aging in place. Make sure to check if your parent’s insurance policy covers stair lifts. Aging in place can present a few unique challenges for older adults. Some only require part-time assistance with exercise or meal preparation, while others are living with serious illnesses and benefit more significantly from receiving live-in care. Richardson, Texas, Home Care Assistance are leaders in the elderly in-home care industry for good reason. We tailor our care plans based on each senior’s individual needs, our caregivers continue to receive updated training in senior care as new developments arise, and we also offer comprehensive care for seniors with Alzheimer’s, dementia, and Parkinson’s. To learn about our high-quality in-home care options, give us a call at (469) 573-4213 today.